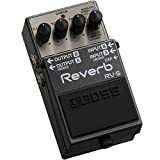 In this roundup, I’ll be taking an in-depth look at five of what are, in my opinion, the very best reverb pedals currently available. I’ll then be awarding, the accolade of The Best Reverb Pedal on the market today to the overall winner. Reverb is such an important effect, not only on the guitar but on any instrument. It is vital that guitarists understand and can manipulate its magic. It can make your guitar tones expressive, enthralling and a perfect fit for any live mix as well as in the studio. Some amplifiers come equipped with reverb, and depending on the amp, some of them are excellent. But they are only a basic reverb, with very few options. A reverb pedal, on the other hand, opens up endless sonic adventures with a vast number of options. If you’re thinking of spicing up your guitar sound, then there’s no better way to do it, than by adding an excellent reverb pedal to your setup. But with so many available. Which are the best options? I bring you five of the best reverb pedals currently available in this review, their pros, and cons and let you know which is my overall favorite, and most importantly, why? Modulation Speed ControlReverb Pedal with RoomCompact Metal Housing. Industry heavy-weights TC Electronic’s Hall of Fame 2 reverb pedal is legendary and has been used by countless famous guitarists over the years. The pedal features ten different reverbs. With separate controls for Decay, Tone and Effect Level, giving you precise control over the reverb settings. You can also expand the pedal by downloading custom reverb sounds from TC’s official website. Many guitarists experience a loss of tone when using reverb pedals. You won’t find that with the Hall of Fame 2 from TC Electronic. Unlike many other reverb pedals, it isn’t all digital, in fact, it uses analog circuitry to ensure the consistency of its tonal output. With regards to the pedal itself, the housing is made from metal and is very sturdy. While the battery compartment is easily accessed by unscrewing a single screw. In terms of functionality, of the Hall of Fame 2 is simply flawless. The controls work, exactly as they should without any issues. Allowing you to dial in any reverb sound you can imagine. If you’re looking for a pedal that’s capable of giving you lots of variety and effortless control of your reverb, the choice is easy – the TC Electronic Hall of Fame 2 Reverb Pedal. It’s quite simply, one of the best reverb pedals around. True bypass design, so your tone remains perfectly intact. A crisp, clear tonal quality. 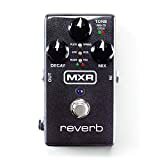 The MXR M300 Reverb is a high-quality pedal specially designed for those who know what kind of sound they are looking for. It is the perfect blend of functionality and versatility. Featuring six different reverb styles, all perfectly crafted and fine-tuned by the team at MXR. Setting this reverb up is easy, thanks to the intuitive design. It comes with MXR’s Constant Headroom Technology which allows it to deliver a massive 20 volts of headroom. Giving space and a beautiful top-end to your reverbs. The six reverb styles give as much versatility as you could ask for, providing you with the same experience and sounds, as you would get when using hi-end audio plug-ins or studio rack effects. It offers many different reverb effects including the standards – plate, spring, room, etc. But, that’s not all, it has others, such as Epic, which is a combination of different analog delays used to make a reverb. Featuring a true bypass design, you’ll have no issues with your tone. And you’ll have no problems integrating it, with your other stereo pedals because it features both stereo inputs and outputs. It’s a premium quality pedal, each effect being meticulously detailed, making it a great reverb pedal for any guitarist. The Holy Grail Nano is regarded by anyone who knows their reverbs as among the best reverb pedals ever created. This pedal has a compact design and could well redefine your reverb experience. Although the Holy Grail only offers three different modes, it does guarantee you a 100% natural feel in all of them. The sound choices may be simple, but the sounds most definitely are not. Clear expansive reverbs are what the Holy Grail is famed for, quite unlike the sounds of many of its competitor’s pedals, which have weak reverb algorithms. Less is definitely more with the Holy Grail Nano. The first sound, the classic spring reverb is what you expect, an honest simulation of the reverb sound found in vintage amplifiers. Next comes the hall reverb, which is very detailed with mesmerizing qualities. At last, and by absolutely no means least, you’ll face the unforgettable flerb, a uniquely ethereal sound that has to be heard to be fully believed. The design of the Holy Grail Nano is so compact that when you look at it, it’s actually hard to believe it can deliver such spacious reverbs. You’re looking at a small pedal, but hearing a huge sound, amazing! Size is definitely not everything with the Electro-Harmonix Holy Grail Nano Reverb Pedal. Comes with a power supply, so no need for batteries. Only comes with those three amazing sounds, many guitarists will want more. Boss is the grandaddy of compact effects pedals and has been making them for as long as anyone. Generations of professional guitarists the world over have been using their pedals for decade upon decade. It is famed for its well-built pedals which deliver excellent features and a fantastic sound, the Boss RV-6 Digital Reverb is no exception. This pedal is a great way to add reverb to your pedalboard. It’s also straightforward to use, just select one of the eight modes – Modulate, Spring, Plate, Hall, Room, Dynamic, Shimmer, or Plus Delay, then tweak the effect level, tone or time knobs, and you’re away. The highly musical reverb effects use cutting-edge technology to provide you with immersive, modern-sounding textures. Plus, you’ve got the Dynamic Mode which automatically adjusts to your playing style producing a luxurious ambiance that won’t muddy up your tone. It comes with auto-switching for easy integration into your set up, an expression pedal input for even more control if needed, and a superb-sounding analog signal path. Equipped with 8 versatile sound modes. Expression pedal input for even more control. Operates in mono or stereo. What happens if you take the excellent Electro-Harmonix Holy Grail Nano pedal and put it on a course of steroids? You end up with a beefier, bigger, more out of control (or should that actually be controllable?) version. Let me introduce the Holy Grail Plus Reverb Pedal. This built like a tank compact stompbox updates and refines the Nano with the addition of a Room reverb setting and more controls. These allow complete control over your reverb time, damping, and modulation speed. It sounds just as heavenly as it’s smaller brother but puts more control into the hands of those who need it. Highly recommended for tweakers. When a sound hits different surfaces at various amplitudes, it creates a complex echo/delay effect of reflections, this is called Reverb. When a listener hears these reflections, it gives them the physical information that defines that particular space. Reverb pedals feature the reflected sounds of different physical spaces. These spaces can then be added to any sound a guitarist wants. So if you want your guitar to sound like it is in a large hall, you simply add the reverb of a large hall. Or if they prefer the sound of a tiled bathroom or a canyon, then you add those reverbs to the sound, easy as that. Digital reverb pedals are very convenient to use, making them the choice of most guitarists. They create all their reverb simulations digitally rather than using an actual spring or a plate. If, however, you’re going for a more vintage sound, then a real spring reverb built into an amp, or as a stand-alone unit, could be a better choice. Most guitarists use a mono guitar set up – one guitar, going into pedals, going into an amp. To get true stereo, you either need a stereo amp or two different amps, as well as a stereo pedal to split the mono signal into a stereo signal. If you have for example two amps, you can send a stereo signal to them, one from each side of a stereo delay or reverb. This creates a far bigger sonic picture. Most reverb pedals are stereo, but not all, so make sure that if you have a stereo rig, that you get a stereo pedal. There is another consideration to bear in mind if you use any other stereo pedals, such as a stereo delay or chorus. In that, your reverb not only needs, stereo outputs but also stereo inputs, to take the stereo signal from your other pedals. True bypass allows the signal to be passed without going through the electronics of the pedal when the pedal is off. Buffered bypass doesn’t – the signal passes through the pedal’s electronics, whether it is on or off. There is a lot of debate about which is best, both systems having advantages and disadvantages. Reverb and Delay may sound similar, but there are distinct differences. A delay re-creates one or more exact copies of the guitar signal, while a reverb reflects the sound of the space the guitar is in. When they are used together, they create an ambient sound with a unique presence. They are always the last two pedals in the chain of effects, with the delay always being placed before the reverb. Reverb pedals vary a lot, some are simple, others very complicated. What best suits you, will depend on what type of music you play and how much control over the reverb settings you want. Some are single function, therefore only one knob, which usually allows you to turn the amount of reverb up or down, but nothing else. At the other extreme, some pedals allow endless manipulation of all the settings and allow you to create the exact reverb space you want for any guitar part. Some pedals only allow one setting at a time, while others allow you to save presets of your favorite reverb settings. Presets can be useful if you want to vary your reverb settings constantly. But many guitarists don’t need presets, and use reverb, much like guitarists did when using an amplifiers built-in reverb. Basically set up a reverb sound that they like and then either have it on or off. Size may be another consideration, the simpler pedals tend to be smaller, some of the more complicated ones obviously need a lot more room for all the controls. If space on your pedal board is an issue, you can always go for a smaller reverb pedal. What are the Different Types of Reverb used in the best Reverb Pedals? These are the most common types of reverb effects that you find in reverb pedals. Some pedals may only contain a few of them, others, all of them or even more. This type of reverb was initially designed as a mechanical system which used one or more actual springs to create the reverb sound. Within the mechanical system, one side of the spring is embedded into a transducer, while the other is embedded in a pickup so that the vibrations can be sensed. Many reverb pedals offer you a simulated spring reverb effect. Some guitar amps, especially models made by Fender, however, still offer the real thing, one or more actual metal springs in their built-in spring reverb tanks. Sound wise, the decay of spring reverb is very fast which produces a bright sound, which is often favored by guitarists, especially rhythm players. Room reverbs are used to create a sound similar to the sonic bounce you would hear in an empty small or medium sized room. They usually have a decay time of less than a second and a subtle sound. Room reverb is useful for retaining the warmth of your sound while creating a subtle reverb effect. Hall reverbs are used to create the sound of your guitar being in a large empty hall. The reverb it generates, is therefore much more spacious sounding than room reverb, with far longer reflections and decay times. Plate reverb pedals were originally massive sheets of metal, which were suspended in a cage, in high-end studios. An audio signal was sent to, and then returned from them. When the ‘plate’ received this signal, it reverberated. This reverberation was then captured and returned as another signal. They create a completely different type of sound to other reverbs and are superb for making guitars sound bigger and more commanding. Reverse reverbs, were originally engineered in studios by recording the tail of a reverb and then reversing it. The reverb effect, therefore, increases in intensity over time as opposed to decreasing as it would do naturally. Modern pedals, do simulations of this process, and it can be an excellent special effect for a specific section of a song. A gate shuts off the sound completely when it decreases to a certain volume. When added to a reverb it creates a wonderful effect, in that you hear the tail of the reverb decay, but when it hits a specific volume, it disappears completely. They are great for use when dialed in perfectly with choppy rhythm guitar sections and for creating big reverb sounds that don’t get in the way of your normal guitar sound. Chamber reverb is again going back to the actual size of a physical space. In that, it emulates the sound of a chamber. They usually have a short decay time of between 0.4 to 1.2 seconds which results in a warmer sound with more clarity. Every pedal featured is a worthy winner in its own right, they are all fantastic pedals, that’s why I choose them as the best of the best reverb pedals. Any of them could proudly sit on my pedalboard. But as is always the case, there has to be a winner, a reverb pedal that allows great flexibility as well as simplicity. The winner is the TC Electronic Hall of Fame 2 Reverb Pedal. The reasons being the superb sounding reverbs, the very high build quality, and its ease of use. I also love its true bypass feature giving you have the clearest guitar tone possible. Other factors making it a winner, included stereo ins and outs and its compact size, perfect for any size pedalboard. But most of all, this is easily my top pick, simply because of its sound. There is a reason this reverb is used by many legendary guitarists. Now you know why.